If you’ve noticed a small dent on your vehicle requiring hail dent removal or light bodywork, your first thought may be that you could be losing your vehicle for several days in the shop. 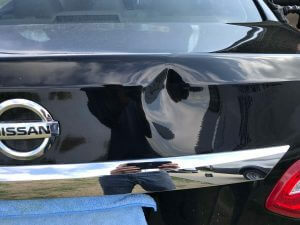 With the assistance of our Gastonia, NC body shop you can get access to a service that we call paintless dent removal. As long as the area that’s been damaged still has the majority of its paint, we can perform this service as part of our mobile dent repair solutions. Most typical bodywork takes several days in a garage to accomplish what we have perfected with this repair strategy, which works for small dents and minor repairs. As long as the area surrounding your dent does not contain many major scratches or issues with the paint, you could be a good candidate for dent removal services. In most cases we can even get your vehicle back to you in just a few hours. Paintless dent removal in Gastonia, NC remains one of the most effective methods for body shop repairs. 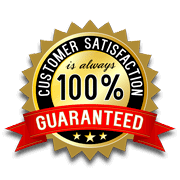 Since it is one of the easiest removal processes, we can get your vehicle back on the road and in pristine condition with 100% satisfaction guaranteed. Our staff members have years of experience in this industry, and through our mobile dent repair services, we can come to your location and make an assessment with a free quote. We want to make sure that you can get fast dent removal services from quote to repairs. 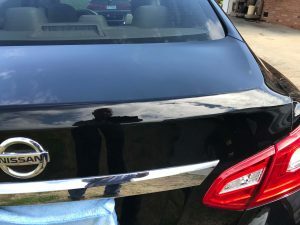 Our Gastonia, NC paintless dent repair is the perfect idea for hail dent removal or even minor dents and accidents that can occur with your vehicle. If you’ve experienced a small accident, contact us immediately before searching “mobile dent repair near me”. Our staff will deliver affordable prices and excellent mobile dent removal in Gastonia NC. Click here to learn more about our mobile dent removal services. We can help with hail damage repair and more for your vehicle!